Rain y days are made for jewelry shopping! There’s something about gray skies that makes gold horse jewelry all the more attractive, you know? Today, we were talking about some of the most romantic horse jewelry in our collection. What makes a piece of horse jewelry romantic? It could be the design: there’s something about the lines of this exquisite 14K Gold and Akoya Pearl Horseshoe Bracelet that seems to evoke a more elegant age, where loving sentiments shared between two people were celebrated with graceful examples of the jeweler’s art.This bracelet is made with an original mold from the Victorian era. It’s a delicate piece that fits securely. Beautiful Akoya pearls accent the golden horseshoe. 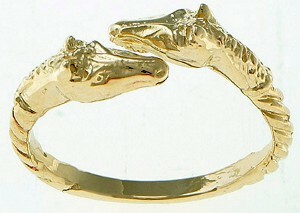 One of our most popular rings, we think this14K gold double horse head ring is pretty romantic. At least one couple has used this ring in their wedding ceremony! It’s also a great ring to celebrate a special anniversary or ‘just because’ – it’s those ‘just because’ moments that help love thrive! The pair of horseheads facing each other, nearly touching, speaks of lasting love and enduring affection. This gold horse ring looks exquisite on the finger. The design is detailed but sits low enough to your finger that you can wear this ring comfortably throughout all of your normal daily activities. Men need romance too! Let the special guy in your life know you’re thinking about him with this 18K gold and woven sterling silver mesh ID bracelet. 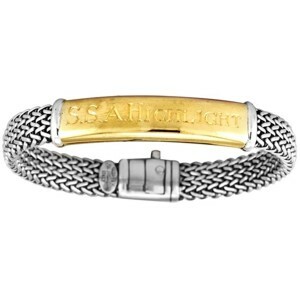 This bracelet features a engravable gold plate that looks fabulous against the sterling silver mesh. It’s a distinctively masculine piece with substantial heft and a rugged feel. The latch closes very securely: great for the active guy! Our favorite quote involving romance and horses is this beautiful sentiment: Every horse deserves, at least once in their lives, to be loved by a little girl. Here’s to all the horses out there, and all those little girls (and boys!) who love them!